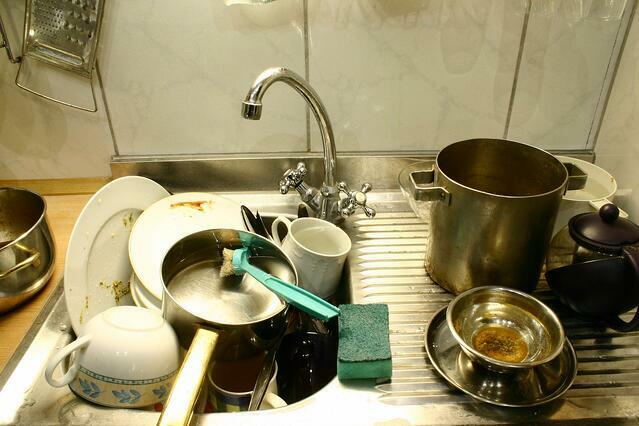 Have you ever engaged in a test of wills over the dishes in the sink? Perhaps you live with a couple of roommates. Maybe you’ve settled in with your significant other, or with your partner and a child or two. It’s morning, and you walk into the kitchen before work. It looks like someone decided to get ambitious and make scrambled eggs for breakfast. Good thinking – wow, it smells good in here. Unfortunately, the cook’s ambition ended with the last bite. The dirty frying pan is sitting in the sink, with a plate, a coffee cup, and some silverware piled on top of it. You set it back down, satisfied that your point has been made. You come home late from work, and can’t help but notice that the frying pan is still in the sink. Although now, the pan is further buried under a couple of plates and a plastic container that looks like it has some type of vegetable baked into it. Your eyes narrow in steely determination. The. Game. Is. On. Your housemates, clearly having practiced for this exact outcome, match you fork for fork, glass for glass. You volley with a dinner plate laced with caked-on cheese from your reheated pizza. Ha! Someone counters with a saucer full of – what is that? – congealed maple syrup. Man! After a few meals, you’re having a hard time finding room in the sink. The battleground is slowly extending onto the counter. You bump into your adversary in the living room – for a second it appears that a wrestling match for the remote is about to commence – but someone makes a joke and before long you are both laughing over the sink. “I’ll wash, you dry,” you say. Ten minutes later, the sink is empty, the dishes are cleaned and put away, and all is forgiven. You’re pretty sure it would have been easier to just wash the frying pan to begin with. It has always struck me that the people I most admire are the ones who never pass by a dirty frying pan. They see the nuisances, the issues, the problems – often, they are annoyingly observant about the problems – and set themselves to the task of correcting them. Rather than getting caught up in a personal test of wills to avoid the work, they make it their job to do the work. For them, the personal test is not allowing imperfection to stand. The stories of the detail-obsessed leader are widespread, perhaps because every great leader embodies this trait at the core. The legendary design standards of Steve Jobs; the exacting nature of Oprah Winfrey’s preparation; the unwavering commitment to pair inclusion and achievement by Sheryl Sandberg; the voluminous, precise directives Winston Churchill wrote to many in and out of his government during World War II. Even the truly sublime leaders, like the great Martin Luther King, Jr., who famously improvised the climax of his “I Have A Dream Speech,” reach this level of perfection through ongoing iteration – King had invoked the idea of his dream many times before, always honing, polishing, perfecting. Great leaders don’t let the dishes pile up; they don’t stand for a piece of garbage on the floor; they find the crumbs and specks of dust and wipe the table clean. They are less concerned with assigning blame than fixing the issue at hand. And the transcendental leaders can do it without making you feel lazy or careless, even if you were the one who left the pan in the sink in the first place. It is clear to me that one mark of leadership is the willingness to correct that which others are willing to leave uncorrected – the willingness to fix the broken thing, to stop when others walk by, to heal the wound that won’t close. But I wonder, more and more, to what level a true leader applies this willingness? How far outside of herself should a leader’s standards reach? I have been thinking about this the last few days. At our Plenty team meeting on Friday, one of our team members voiced her shock, frustration, and despair at the recent murders in Charleston. What, she wondered aloud, is our obligation here? Where do our business interests and our moral interests conflict – and in a company named “Plenty,” should they ever conflict? We can probably agree that it is kind and generous to wash our roommate’s dishes. To do that which is right but not required by those we love is one small brand of leadership. Further, we can probably agree that in the workplace, a leader has the obligation to address the issues she sees around her in her team. Even a mediocre manager is interested in improving the issues she directly supervises. But what is our obligation beyond that? A good leader is willing to address the problems in her overall organization, even if she isn’t directly responsible for them – because a good leader knows, in a larger sense, that by entering the building or wearing the organization’s brand, she is associated with those problems, and so she bears responsibility for fixing them. This is no easy task; perhaps one of our hardest challenges at Plenty is advising nonprofit leaders to address issues that are in their sphere of concern but outside of their sphere of control. Do we have an obligation beyond that? Do we have an obligation, for example, to address what we see in the nonprofit space as a whole? I certainly think so. At a time when there are so many positive trends in philanthropy colliding with so many concerning ones, we need more leaders pushing the space to improve. This isn’t always popular, and some might say it is downright counter-productive. But then again, I think of the dishes piling up in the sink. Aren’t we all better off if we just start washing them? And finally, what is our leadership obligation beyond even that – beyond our homes, our jobs, our organizations, and our industry? What is our responsibility there? What is the expectation? It is tempting to think that the world at large will be handled by someone else. Alas, I don’t know much, but this I’ve learned – “someone else” is never going to arrive. Unfortunately, in selection of teams for the cosmic game of character kickball, we are the only people from whom we can choose. We are the only witnesses to the problems of the larger world. We are the only solutions. It is tempting to think that the murders in Charleston, widespread intolerance, institutionalized injustice, machineries of hate and war, systemized destruction of the planet around us, disenfranchisement across the world, and global inequality are too big to handle. And I make no mistake – these are heavy, heavy pans in a deep, wide sink. Cast from iron bars and steel walls, they defy our ability to measure them, to gauge their weight. They challenge us to even know where to lift. But still, there they are. Just sitting in the sink. Waiting, waiting, for someone with a cloth to come along. Perhaps we can’t do much. But we can definitely do something. And like anything else, the dirt comes out when we start scrubbing. We want to help you. Let Plenty be your partner in creating a strategy designed to generate rapid and measurable impact. Download our Seven Success Factors e-book and explore the seven components critical to fundraising success and how you can improve each segment!